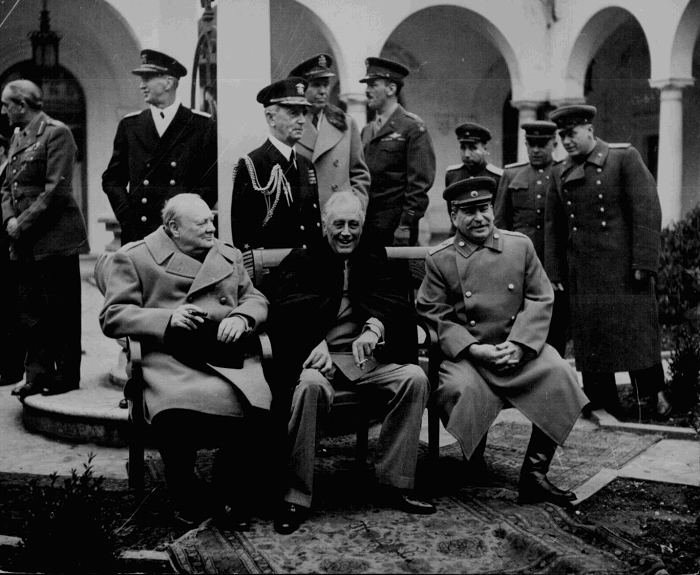 Original caption: "Conference of the Big Three at Yalta makes final plans for the defeat of Germany. Prime Minister Winston S. Churchill, President Franklin D. Roosevelt, and Premier Joseph Stalin." February, 1945. These three prominent Allied leaders met periodically throughout the Second World War. Churchill was leader of Great Britain (United Kingdom), FDR of the United States, and Stalin of the USSR (Union of Soviet Socialist Republics). Click here to enlarge.